Hans Rudolf 'Ruedi' Giger, born in Chur, Grisons Canton, Switzerland, 5 February 1940 – 12 May 2014, is a Swiss surrealist painter, sculptor, and set designer, who won an Academy Award for Best Achievement for Visual Effects for his design work on the film Alien. Giger's style and thematic execution have been influential. His design for the Alien was inspired by his painting Necronom IV and earned him an Oscar in 1980. His books of paintings, particularly Necronomicon and Necronomicon II (1985) and the frequent appearance of his art in Omni magazine continued his rise to international prominence. Giger is also well known for artwork on several records, one of which was the highly controversial and surreal cover art for Emerson, Lake, and Palmer's landmark progressive rock album "Brain Salad Surgery". The cover art was originally deemed too sexually explicit to be shown on store shelves, but was edited before release. 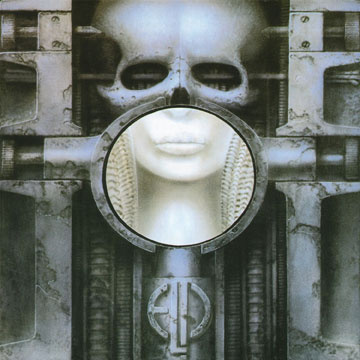 Giger's design for that ELP album stands out as one of the best examples of 1970's record cover art to this day. Giger got his start with small ink drawings before progressing to oil paintings. For most of his career, Giger has worked predominantly in airbrush, creating monochromatic canvasses depicting surreal, nightmarish dreamscapes. However, he has now largely abandoned large airbrush works in favor of works with pastels, markers or ink. His most distinctive stylistic innovation is that of a representation of human bodies and machines in a cold, interconnected relationship, described as "biomechanical". His paintings often display fetishistic sexual imagery. His main influences were painters Ernst Fuchs and Salvador Dalí. He met Salvador Dalí, to whom he was introduced by painter Robert Venosa. He was also a personal friend of Timothy Leary. Giger is perhaps the best-known sufferer of night terrors and his paintings are all to some extent inspired by his experiences with that particular sleep disorder. He studied interior and industrial design at the School of Commercial Art in Zurich (from 1962 to 1970) and made his first paintings as a means of art therapy. In 1998 Giger acquired the Château St. Germain in Gruyères, Switzerland, and it now houses the H. R. Giger Museum, a permanent repository of his work.